Beer duty will be cut by 1p per pint, while taxes on ordinary cider and spirits are to be frozen, Chancellor George Osborne has said. The cut in the price of a pint is the second in two years, and was welcomed as "fantastic news" by the industry. The alcohol duty escalator, which sees prices rise at a rate of 2% above inflation, has again been scrapped. But health campaigners said the cut was "staggering" and warned of a dangerous impact on public services. Announcing the spirits duty freeze, the chancellor pointed to the "huge British success story" of Scottish whisky. And he said the decision to freeze duty on ordinary cider was made to help "cider makers in the West Country hit hard by the recent weather". The Treasury estimates the changes will cost about £1.5bn over the next five years. Brigid Simmonds, chief executive of the British Beer and Pub Association, called the chancellor "the toast of Britain's brewers, pubs and pub-goers". "It also shows that the government has understood our case, that taxes on British beer had become far too high, and action was long overdue," she added. Mike Benner, chief executive of the Campaign for Real Ale (Camra), said the tax cut was "vital" to "helping an industry which has been in overall decline continue on its long road to recovery". The 1p per pint cut equates to a 2% reduction in the rate on standard strength beer, while duties on low and high strength beer will be cut by 6% and 0.75% respectively. All other alcoholic drinks, including wine and high strength sparkling cider, will see duties rise at the rate of the Retail Prices Index - the higher of the two inflation measures - which currently stands at 2.8%. Health campaigners have called the chancellor's decision to scrap the alcohol duty escalator "staggering". Katherine Brown, director of the Institute of Alcohol Studies, added: "With alcohol-related hospital admissions more than doubling over the last 10 years, it comes as a shock to learn the chancellor believes it is right to further incentivise drinking by making alcohol cheaper." Image caption The chancellor called Scottish whisky a "huge British success story"
Eric Appleby, chief executive of Alcohol Concern, said the tax cut could increase alcohol misuse, which he said costs the UK £21bn a year. 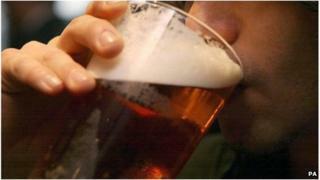 "The chancellor has given the alcohol industry the green light to make bigger profits at all of our expense," he added. In February, the Alcohol Health Alliance, which includes the Royal College of Physicians and the British Medical Association, warned that axing the escalator would put even more pressure on public services. However, Mr Osborne said the government had already taken measures to combat misuse. "We've introduced new laws to prevent alcohol being sold below minimum tax rates, and this helps prevent supermarkets undercutting pubs, and helps stop problem drinking," he added. "It's a far more targeted approach than the alcohol duty escalator hated by many responsible drinkers." Meanwhile, tobacco duty is to rise by 2% above inflation, but despite the increase, health campaigners said they had been hoping for more. British Lung Foundation chief executive, Dr Penny Woods, said the chancellor had "missed a great opportunity" by not increasing tobacco duty by 5%, as some health experts had suggested. "The evidence suggests it could have saved thousands of lives into the future," she added. The Tobacco Retailers' Alliance (TRA) said the 2% increase played into the hands of tobacco smugglers. The chancellor also said that a planned rise in fuel duty this September will now not take place, marking the fourth year of tax freezes at the pumps. But he resisted calls to cut duty, to the disappointment of motoring groups. "The freeze still leaves the squeeze on families and businesses that rely on four wheels to function and prosper," said AA president Edmund King.